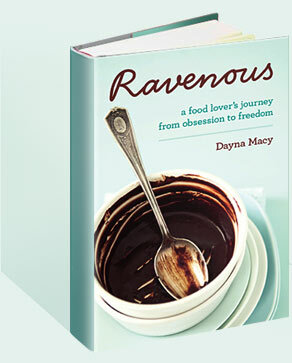 2008 September — Dayna Macy, author of "Ravenous"
I met Paul Newman for 8 seconds back in 1995. I was the publicist for Mario Andretti’s autobiography, “Andretti,” and was at his last race in PA. Paul Newman, owner of the racing team Newman-Haas, and a close friend of Andretti’s, was there too. I was walking by a trailer when suddenly the door swung open and there was Paul Newman. It’s true what they say about his eyes — they’re that blue. But what I saw in that 8 seconds was an acute intelligence, great humanity, and more than a little humor. Amen Mr. Newman. Rest in peace. Campbell Brown – "Free Sarah Palin!" This video of Campbell Brown on Sarah Palin was just too good to miss. I spoke with an editor friend today. A segment on yoga, which was supposed to air on NBC Nightly News and included one of our contributors was bumped. It was easy to see why — Wall Street’s meltdown, the upcoming election. A lot of news happening right now — most of it pretty bad. As bad as the last eight years. “Whatever happened to the country we used to live in,” I asked her? Bush has done so much damage, that country seems irretrievably gone. The GMA interview with Charles Gibson and Sarah Palin was painful. She was condescending, insincere — sounding like a windup toy fed an overdose of soundbites, but most important, she was unprepared — for the interview, much less the vice presidency. I don’t care if she’s female, white, black, green or martian, she is not ready to be president. It’s as if the wrath of God had descended on the Republican party. First, Gustav blows the Republican convention off the map (though it provides a convenient excuse for the President to skip the convention). And today we learn that Sarah Palin’s 17 year old daughter is pregnant. Whatever McCain’s campaign says, I do not believe he knew about the pregnancy. I also agree with McCain – it is a private family matter. But that’s not the point. What does this say about McCain’s judgment? The vetting process was obviously rushed, and now seems like an imploding disaster. Is this the person anyone wants to have his finger on the button?